Royal Domain (Sri Putramas II) condominium is located along Jalan Kuching, just minutes from the city centre and well connected to nearby suburban developments like Sri Hartamas, Damansara and Bangsar. Royal Domain comprises 4 blocks of 37-storey condominium with a total 1022 units. The condominium comes with 3 bedrooms, 2 baths and a large balcony, and the built-ups ranging from 1,125 to 1,400 sq.ft. The facilities include swimming pool, tennis, gymnasiums, club house, nursery, restaurant, convenience store, movie room and unique landscaped recreational areas with water features and water falls. 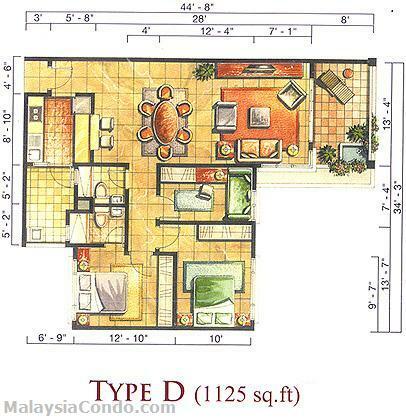 Built-up Area : 1,125 - 1,400 sq.ft. i dont think that type d and type J are exist?